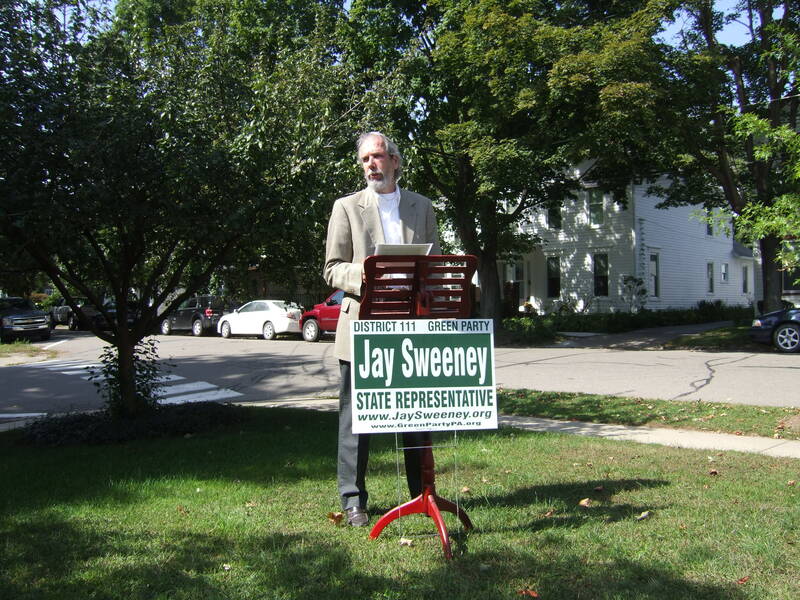 I will be at the polls in Tunkhannock Township tomorrow afternoon, volunteering for Jay Sweeney’s candidacy. He is lean and Green and has a chance. In the morning I will vote at the Back Mountain Library, then take my mom to vote at the Dallas Township Building before heading north. I am voting for Sestak, and Onorato. Please make sure to vote. Among the activist groups supporting the Earth Day protests are: The Sierra Club, Gas Drilling Awareness Coalition (GDAC), Citizens for Clean Water, No Drill NEPA, Energy Justice; to name a few. Speakers will include Dr.Gere Reisinger of GDAC, Dr. Richard Aston of the Green Party, Atty. Frank J. Muraca from the PA Sierra Club and Jay Sweeney of the Wyoming County Green Party and candidate for State Representative in the 111th District. You are currently browsing the archives for the Green Party category.